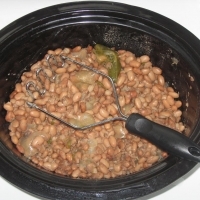 Place beans into sprayed crock pot. Add garlic, onion and pepper, just set them right on top. Add about 1/2 the salt. Add liquid until covering beans with about 1-2 inches extra. Cook on low about 8 hours until beans are soft. With potato masher, carefully mash beans until desired consistency. Return to heating element and add rest of seasonings. Stir well. Taste. Adjust seasonings as needed. Heat on low or warm about 30 minutes just to let seasonings blend. Easy to make and awesome taste. I added a pinch of cayenne and finished them in cast iron to thicken them up a bit...I mashed them with too much liquid left in the mix. Delicious recipe! 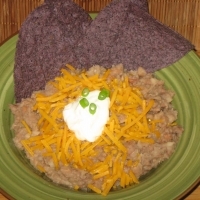 Looks like a Great refried bean recipe, i make it somewhat similar to this, just not in the slowcooker, but i should try it! I DEFINATELY agree with you on the soaking overnight method, it isnt necessary but well worth it! A huge difference in my opinion, im looking foward to trying your recipes! Great recipe! I've never even considered making my OWN refried beans, but this sounds great for my next get together. I will probably add some kind of chiles, though. Thanks for this recipe Keni, mine always come out pretty bland. I will definately use this next time. 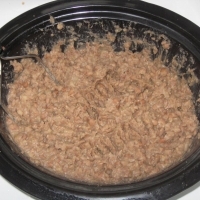 I make my refried beans with the same ingredients only with additional chili powder and I cook them on the top stove. Great recipe. Will make this next time we cook a Mexican dinner.